In the short time the Ohio Valley Beach Volleyball Club has been around, we have created a program that provides our players with everything they need to do to improve their game and go on to play beach volleyball in college. we have been able to work with some amazing players, and we have seen firsthand what can happen if players work hard and follow our program. The vast majority of our graduating club members have received scholarships to play beach volleyball in college. We have had amazing results, and we are so proud of these young ladies for the time, effort, and work they have put in to find success. Each one of these players will always have a special place at our club, and we want to honor them for their achievements. We want to make sure we acknowledge all of them as being great beach volleyball players, and amazing young ladies as well. 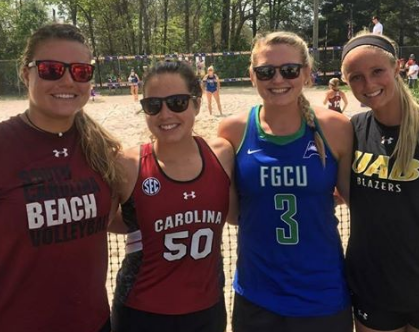 We want to make sure to let players and parents know that if you come to Ohio Valley Beach Volleyball Club and work hard like these players did, you to can play beach volleyball in college on scholarship. *** Many more of our players are currently being recruited by colleges to play beach volleyball. Please check back for more updates coming soon. If you are a college coach that needs more information, video, or an introduction with any of our players, please reach out to us. We are happy to assist you. I really love the website. A lot of good beach volleyball content. Paige, Thank you for your kind words. We have worked hard on our website, and we are very happy with the exposure it gets for our club and more importantly for our players. We are glad we have so many people coming by every day to read up on the latest happenings at Ohio Beach Volleyball Club. Thank you for your support.